This surgery in Islington, was moving from its rather cramped and confusing home, to a newly built development, including residential property above. The new surgery was designed and built for purpose, and was a huge improvement for GP's, staff and patients. As most new buildings though, it was lacking a little of the human touch. Two enclosed courtyards acted as natural light wells, adjacent to the patients waiting area, and to the corridors and staff kitchen. Outside the consulting rooms were two narrow and high walled spaces. The areas had been decked only, and I was asked in to breathe a little life into them. I worked with GP's from the practise, and the builders, starting the process before the building was complete. Opportunities to plant were limited to containers only, as there was a car park under this level. 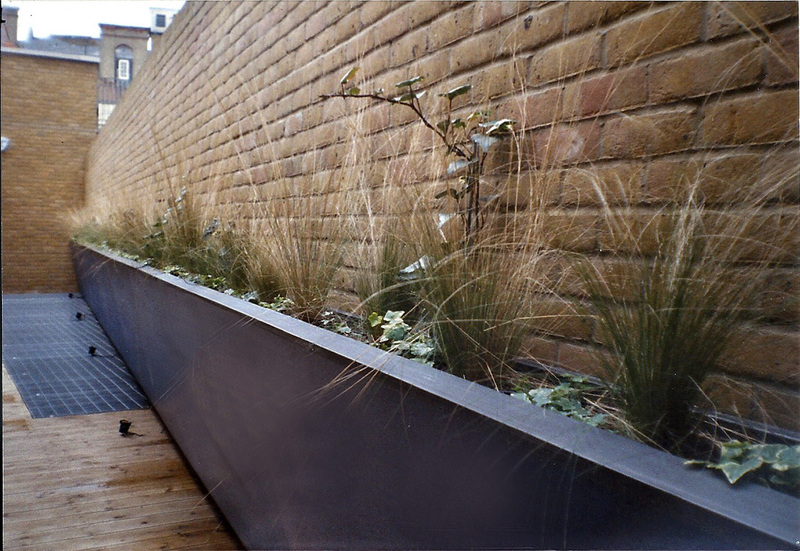 The planting had to be pretty much self maintaining, so choice of plants was crucial and watering systems were installed for each area. In the light wells, the new decks were cut to take the planters and the long pond. 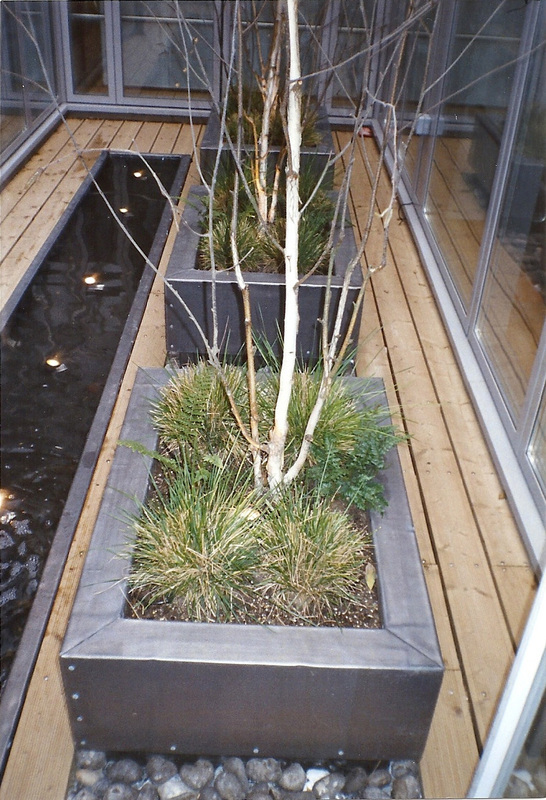 Heavy timber planters, clad with lead, and lined with Butyl were positioned on the deck bearers. 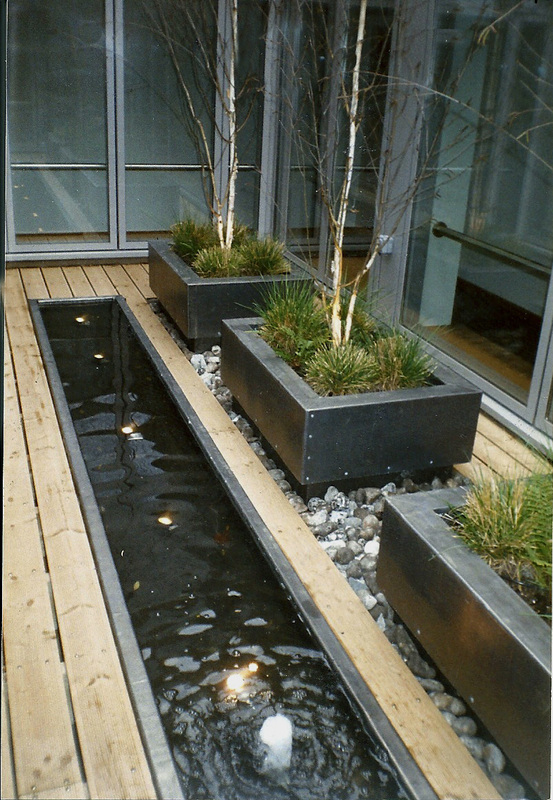 the long pond had a simple gusher fountain at one end, and lights were installed in the planters, to uplight the pale bark of the small trees, and in the pond. 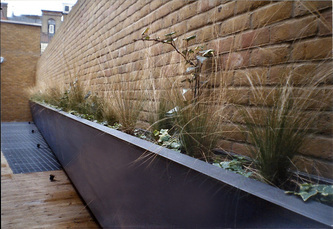 In one of the areas next to the consulting rooms, a long panel was constructed to break up the monotony of the wall, topped with a narrow planter. 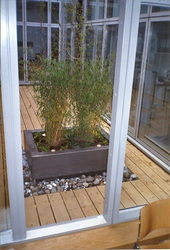 Watering was installed, and low voltage halogen lights played onto the coloured panel at intervals. 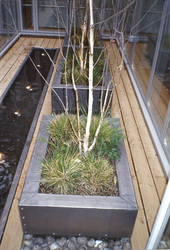 The second area was darker, and three planters were constructed on a stone shelf, all lit and watered. 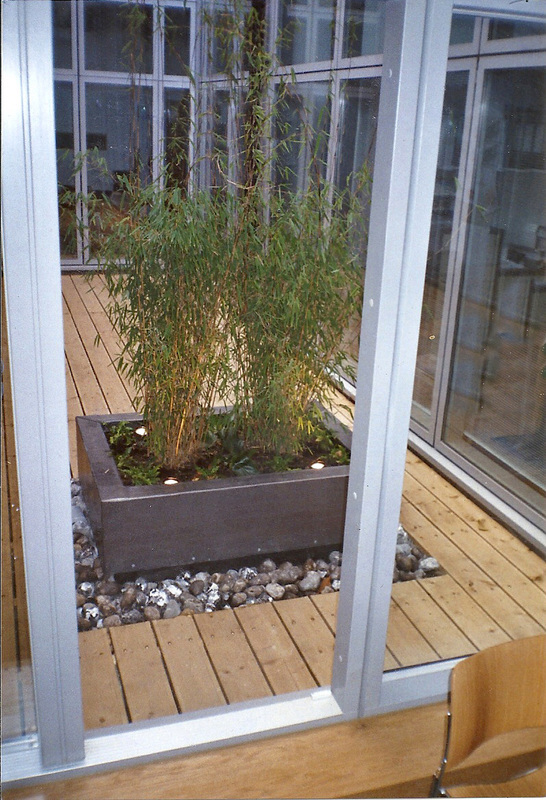 The 'landscaping' was very well received by health workers and visitors alike. Together with very good planning overall, the new surgery not only worked well, but had some instant character. It was unanimously felt that these little touches really do help towards creating a less anxious, more relaxed and 'healthy' atmosphere.